Western Digital kicked off its booth at Macworld/iWorld by unveiling the new My Passport Pro portable hard drive equipped with Thunderbolt. 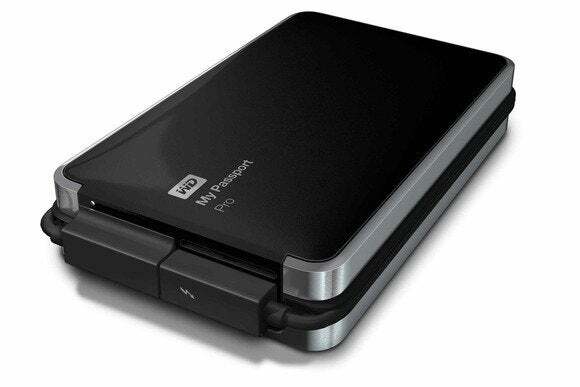 While the My Passport Pro looks similar to WD’s My Passport Air, the new drive is much thicker because it has two 2.5-inch hard drive mechanisms configured as a RAID 0 or 1. The My Passport Pro also has an integrated Thunderbolt cable, so not only do you not have to worry about buying an expensive Thunderbolt cable, but you also don’t have to worry about carrying and losing that cable. The integrated cable also provides power to the drive, so you don’t need an external power supply. The My Passport Pro is available in a 2TB capacity for $300, and 4TB for $430.